Towels can be rented with us, or you can bring your own. Sleeping-bags are not allowed. Marken Gjestehus Hostel is a reasonably priced (from NOK 220, - per person) and pleasant alternative to hotel accommodation. Ideal for individuals, groups and families. We offer new, comfortable, light and airy rooms of a great standard. We have 29 rooms in total, ranging from 1 to 10 beds. We offer rooms with shared or private bathroom. For the rooms which have shared bathroom facilities, you will find plenty of excellent restrooms/shower facilities in the corridors. All rooms that are listed here have shared bathrooms, and all the rooms have bunk beds. For request for rooms with private bathrooms, and for 2-bed rooms with double bed (two separate beds) please contact Marken Gjestehus Hostel directly. We are located in the heart of Bergen, within walking distance of train- and bus station, tram stops and all the city’s attractions. Banks, post office, food stores, shopping areas and restaurants are also close at hand. If you would like to enjoy the beautiful nature surrounding Bergen, you find Fløyen and Fløibanen only minutes away. 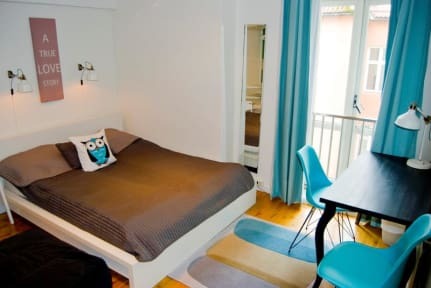 Marken Gjestehus Hostel has all the facilities you would expect of a modern hostel; pleasant rooms and dorms, TV lounge, fully equipped guest kitchen, and laundry facilities. Breakfast can be ordered, and a soft drink and coffee machine is available. Welcome to an informal atmosphere. We will do our utmost to make your stay a pleasant one! •We have limited opening hours off season. After you make a booking, we will send you an email with the current hours. Please make sure to read this email. •For Non-Refundable bookings: the hostel is entitled to charge your credit card with the remaining balance up to 48 hours after the booking was made. •You have to be at least 18 years old to stay in dorms. Great experience in bergen. Very good position, good common spaces. Just kitchen a little bit small compared to the number of guests but useful. Very nice hostel located 5 minutes from the train station and 10 from the city center. Very new, comfortable and cleane (the only bad aspect was the kitchen that was very dirty, but it’s also fault of the hostes). La struttura é molto bella e pulita. Sì trova in centro città quindi molto comoda. Ha tutti i comfort necessari. Buona sistemazione per soggiornare nella carissima Bergen. Il rapporto qualità prezzo è buono per la Norvegia. Posizione buona, si va a piedi in centro, stazione a 2 passi, bella vista sulla montagna. Personale molto simpatico e disponibile. I bagni non sempre si trovano proprio puliti, colpa anche di chi li usa con poca cura. In conclusione lo consiglierei e sono soddisfatto.